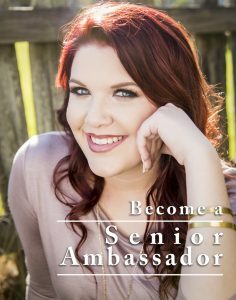 As an ambassador, you will represent Andy Crawford Photography during your senior year in high school, beginning the summer after your junior year. Only a select number of applicants will be chosen, so it’s an elite group. Ambassadors share out photos from their custom senior portrait sessions, hand out cards and flyers, and generally talk up Andy Crawford Photography. Andy Crawford Photography ambassadors simply spread the word about the studio to other seniors. Being active on social media is a must; ambassadors are expected to share out watermarked photos on Instagram, Facebeook, Snapchat, etc., on a regular basis. Not active on all platforms? No problem, as long as your parents are active. So while the ambassador might be most active on Instagram, his or her parents can be spreading the word on Facebook. Ambassadors and their parents are asked to like/follow Andy Crawford Photography’s fan pages. In addition, ambassadors will be given cards and other promotional material that should be passed out to their friends. Every ambassador receives a custom photo session at the location of his/her choice within an hour of Prairieville, La. We will spend time walking through the location, capturing fantastic images and building an amazing gallery of photos. During a follow-up session, each ambassador and his/her parents will pick out their favorites that will be used to share out on social media. Digital images sized for social media and watermarked with the ACP logo will be provided free of charge. In addition, a selection of images will be used to build free senior ambassador cards that can be handed out. So what other benefits do ambassadors receive? • No minimum order for prints. Normally, high-school senior portrait sessions require a $400 minimum order. • 10% discount on all ordered prints, invitations, etc., for each referral who signs up for a session, up to $400. That means just 10 sign-ups mean all prints are free up to the $400 max. • 25% discount on all prints for any followup photo sessions (i.e., family portraits, siblings’ senior photos, etc.) for one year following graduation. Excludes non-refundable scheduling fee. All St. Amant, Dutchtown and East Ascension High School students who are in their junior year or entering their senior year of high school can apply. It’s important to note that not everyone who applies will be chosen, but every applicant will receive a 10% discount on prints (excludes non-refundable retainer) when they sign up for a session. That’s easy: Just click the button below and fill out the form. Once you submit the form, we will go through the applications and chose the best applicants. Everyone will receive notice of the final decision on their application.